Recently Marmoset asked the community what organizations we should give a bit more to attention to and the message was heard loud and clear. Here are the three non-profits we’re doing a bit more for this year — and here’s why you should also care about each one. Rock 'n' Roll Camp for Girls empowers girls through a creative environment, where attendees can experiment with music and art, building confidence through performance and collaboration. Marmoset has partnered with Rock ‘n’ Roll Camp for a consecutive amount of years and for good reason: music is our purpose and we believe in the cultivation of a more inclusive and diversified future for the music industry. Donating to the organization doesn’t stop at making the camp’s program even more accessible and dynamic every year, it casts a wide net over their provisions — like how donations provide tuition assistance for campers who otherwise wouldn’t be able to attend due to financial burden. Then there’s the cost of instruments, gear, venue spaces, materials for their immersive workshops, food and provisions for volunteers and interns. Since starting the camp 18 years ago, Rock ‘n’ Roll Camp has served over 3,000 girls and gender expansive youth in Portland. Zooming out to look at the bigger picture, each camper takes those lessons and experiences back with her, contributing to a better and brighter future for music and her community. The Salvation Army does a lot and we’re willing to bet you’ve heard of them too. Since they have such a global presence and far reaching influence, we wanted to offer support on something closer to home — to their Care for Camp chapter. Care for Camp provides assistance to the Del Oro region, covering Northern California and Norther Nevada. Subsidizing the group means supporting their team as they tackle natural disasters, while also going toward their on boarding program, food and resources, rent + utility assistance, shelter, rehabilitation, transitional housing, plus youth and senior programs. It’s a bit of everything that can help a community recover, flourish and thrive. IRCO is that kind of like that overachieving kid you knew in high school who played every sport while still acing all their AP classes. The Immigrant and Refugee Community Organization supports immigrants and refugees from all over the globe, providing a limitless amount of resources when coming to a new country. From educational programming, employment and training, language to legal services, IRCO covers all facets of living. But they go beyond just the necessities, they focus on building community within their organization, facilitating a habitat for celebrating one’s culture. IRCO realizes the importance in creating a shared and safe space for individuals, allowing them to connect with others who share similar experiences and backgrounds — allowing people to proudly continue carrying their stories and cultural inheritances. Posted on March 13, 2019 by Michelle Goldstein and filed under Community, Marmoset, Music, Music Licensing, Spotlight: Marmoset and tagged Salvation Army IRCO Rock n Roll Camp for Girls Music Licensing creative music Sound Design. Marmoset: Which women artists were you inspired by growing up or are you continued to be inspired by today? Thai: Female artists are my faves. I only spoke and sang in Chinese until I was six years old, so I listened to a lot of Teresa Teng, Faye Wong, Sammi Cheng and Cass Phang in the early ‘90s. After I started speaking English, I mostly listened to power vocalists — Mariah Carey, Whitney Houston, Christina Aguilera and Celine Dion. I wanted to learn how to sing just like them growing up… still can't, but hey, I found my own sound, and that's pretty cool! I am continually inspired by Amy Winehouse, Sia, Jessie J, Joss Stone, India.Arie, Kelly Clarkson — love and respect them so much. M: What did your journey into music first look like? Thai: I never knew that music could even be a career when I first started playing music. I started college when I was 13 years old believing that school was the only way to become successful in life. My community probably still believes that music is only supposed to be a hobby, which is just sad. I would tell my younger self that there are so many career options in the future. Everyone's potential is limitless. M: How would you describe the music you like to make? Where would you like to take it in as you grow as an artist? Thai: My music has always been on the darker side lyrically and I would like to explore lighter and more inspirational writing in the next few years. Those dark days are over and I want my music to genuinely reflect how I am feeling at the moment. I am proud to have been able to connect with my fans on another level through my music. Many of the supporters from the last decade know me through comedy and covers on YouTube, so it's amazing to develop a new connection through my original songs. Thai: I think everything comes down to being genuine and being unapologetically you. I have struggled with this throughout my life and still do sometimes as an adult. As an artist in 2019, it's not just about the music anymore. It's about connecting with people. M: How do you reset after a challenging day in the studio (or just in general)? Thai: I think hard days are all about perspective. Hard days are just life lessons for me — it happens, I learn something important and life goes on. Knowing my purpose is enough to keep me going. My driving motivators are my family, my friends and my fans. M: What are you excited about in 2019? Thai: I’ve been working on my album and I am most excited about the two new singles that will be released this year. The next release is titled, "Circles" produced by Graham Barton at Marmoset, which is super exciting! The one after that is titled, "Temporary High" produced by Christian Mochizuki. I can't wait for everyone to hear the new jams! Posted on March 8, 2019 by Michelle Goldstein and filed under Community, Artist Spotlights, Marmoset, Music, Spotlight: Artists, Music Licensing and tagged Music Licensing Marmoset Music Licensing original score Original Score Music + Picture copyright music Free Download. Our Womxn of Music series continues as we spotlight risk-taker Michele Wylen. With her past work featured in empowering content like 2018’s Be That Girl Sportsgirl campaign, Wylen’s music is the upbeat anthem that makes us feel like anything is possible. With a list of creative projects lined up, Wylen is also hard at work in the community extending her support, time and attention to address climate crisis. Naturally, we wanted to sit down to catch up with Wylen to learn more. Marmoset: You have such a passion for being active in the community, what have you been up to most recently? Wylen: I’ve been very engaged in my city’s effort to lower its greenhouse gas emissions. I work with Citizens Climate Lobby and People for Climate Action, as well as other community groups, and I engage with my city councilmembers. Though I live and breathe music, one thing my art could not fulfill for me, was my passion to get my hands dirty and do some practical work to help the world. I was born to sing but I was also born to solve problems. Our climate crisis is a definite problem, and it is deeply fulfilling for me to be a part of the solution. M: Who were some of your earliest sources for inspiration in music? Wylen: The first female artist I grew up listening to was my mom. She was a singer and songwriter, and she’d always be in the studio recording while she took care of me. When I was in the Philippines in elementary school, my mom sang the theme song for a popular soap opera and it became a hit on the radio. She also wrote songs for other Filipina artists. Several times she brought me with her to the studio in Manila to watch them record. Being exposed to this at a young age inspired me to pursue this kind of work for myself. My first CD was Spice Girls Spiceworld. Missy Elliott also got a lot of play in my CD player. It was the sassy, empowered female artists who attracted me- I rarely listened to forlorn songs about broken hearts. I definitely went through a Britney Spears obsession, and I sang a lot of Destiny’s Child. In high school I became mesmerized by Alison Goldfrapp and I’ll never forget seeing her perform at the Crystal Ballroom. Witnessing her magical presence on stage filled me with an insatiable desire to perform on stage myself. Then in my early twenties I got super into Peaches. I loved how abrasive she was, how she went against the grain — her songs resonated with the rebel inside me. Watching her perform at the Wonder Ballroom really inspired me to think outside the box in terms of my own performance art. Her background dancers were over the top, wearing costumes of giant pom poms with legs in high heels sticking out. It was ridiculous and amazing. M: As a professional artist now, who inspires you today? Wylen: If I had to choose one female artist who I’m continually inspired by, it’s Rihanna. A queen of style and music, now with empires in makeup and lingerie, she doesn’t let her entertainment business get in the way of the great work she does with the Clara Lionel Foundation. I lust for her slay but her community work is what makes me love her. Female artists currently on my playlist: Asian Doll, Cardi B, Nicki Minaj, Sia, Killumantii, Missy Ellliott, Rihanna. M: Self empowerment and confidence is so important for young women, especially in the music industry. What are some lessons you’ve learned along the way? Wylen: I’d say the most important thing is to know who you are and know what you want. If you’re not sure then you’d better take the time to figure it out. When you’re a budding talent, other people will want to impose their vision on you; so if you’re not sure of yourself, you may find yourself one day living out someone else’s dream and wondering what happened to yours. What happens when you rely entirely on music for your income is you give up the control you have over what projects you work on. You’re basically forced to accept any paying project that comes your way, even if you don’t feel it in your heart. I used to have this obsession of being able to say I made all of my income from music. But it was so stupid because as a result I wasted years of my life not exploring my art and instead was chasing money. I don’t regret it — the experience did refine my skills and I learned a lot about collaborating in a professional environment. But I’ll never let money control how I use my artistic talent ever again. M: Knowing what you know now, what would you pass along to your younger aspiring artist-self? Wylen: If I could speak to my younger self I would say… relax, be patient and keep your life in balance. Yes, we have to grind and hustle and spend a lot of time in the studio to develop our skills. However, we must still balance that with our personal health. When we are sound in our mental and physical health then we can come to our music from a place of clarity and control. I should have spent more time with my friends and family and working out personal issues. Thankfully, I’ve learned my lesson and my life is in much better balance now. M: Can you give us a sneak peek about what music you have in store for us in 2019? Wylen: Well, I don’t want to reveal too much I have a new single with Niko Javan coming soon that I’m excited for. Also excited about a collaboration with Graham Barton. Other than that, I’m just in exploration mode right now. What I’m most excited about in 2019 is empowering myself to say “no” to incoming commercial work so that I can have the freedom to explore my creativity. Also, I’ll be filming a music video this year and I haven’t made a video since 2012 so needless to say I’m really excited for that. It’s long overdue. Posted on March 7, 2019 by Michelle Goldstein and filed under Community, Artist Spotlights, Marmoset, Music, Music Licensing, Spotlight: Artists and tagged Marmoset Artist Profile Marmoset Music Licensing copyright music Music Licensing. To the womxn of music, thank you. Not just for paving the way for others to follow in your footsteps but for speaking your truth when the noise tried to drown you out, the times you kept showing up even when it was exhausting or felt thankless. Thank you for always relenting, speaking up, inventing and overcoming — for sharing your stories and not backing down. It matters and whether it felt like it in the moment, it was noticed. March 8th is International Women’s Day and for the Marmoset community, it’s not just a day of recognizing and honoring the achievements and history made by women — we strive to do that the other 364 days out of the year. Instead, it’s about reflecting on each other’s journeys, lifting one another up while looking ahead; because staying sharp and strategic is the only way to stay ahead of the game. And while an internationally celebrated day of recognization is nice… we decided to share the microphone with five amazing artists we work alongside and whose music we feature on our roster. Because we’re not just fans of their music, we’re admirers of their mentalities, their spirited hustle and won’t back down attitudes. New York City native, Fritzwa gave us the lowdown on her new music and the momentum that gets her up in the morning. After changing up her creative environment by leaving New York for Portland, Oregon, Fritzwa now hustles back and forth between lush Pacific Northwest and bustling Los Angeles, California. This year she’s taking the west coast by storm, taking on musical collaborations between cities. And there’s no question of the determined spirit that fuels the artist, she’s continually setting out to conquer, pushing back in the face of opposition. And with being in the position of trading a high-level marketing job with Nike to produce music full-time, Fritzwa uses this chapter in her life as a motivator for growth. Creating music is a livelihood for her — she’s a businesswoman just as much as she is a musician. 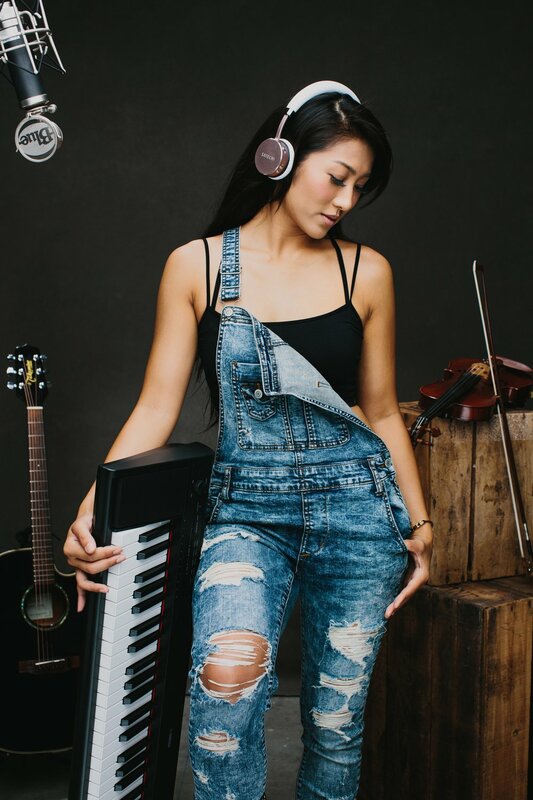 Physical backdrops aside, Fritzwa is an artist who embodies constant evolution and change, her work ethic an example that even those outside the music industry can draw motivation from: here’s a woman on the move, eager to learn, grow and challenge herself even if it pushes her to the limits. And in the common scenario of women (especially those of color) being singled out or underrepresented in positions of authority, it can be easy to succumb to a certain of complacency — to simple accept rather exert more energy in pushing back. But for Fritzwa, it’s about putting in the work and time now and going the distance. Currently producing new work in Los Angeles, Fritzwa is exploring Afrobeats with her newly released music — her past two songs a fusion of West African stylings and pulsing electronic elements. “Shake Waist” is a sample of the latest direction she’s been heading musically. And while just a sample of her recent projects, Fritzwa is gearing up to dish out a variety of singles this year; the work will encapsulate her initiative toward exploration, a meld of collaboration with different producers and crossover of genres. It’s a year of beginnings and active diligence — most importantly, it’s crucial to note they’re products of her skilled talent and determined spirit. She’s making it happen. * We recognize women of all origins, backgrounds and identities. Posted on March 6, 2019 by Michelle Goldstein and filed under Community, Artist Spotlights, Music, Music Licensing, Spotlight: Artists and tagged international women's day music Music For Short Films Filmmaker Musicians Featured Artists. Jené Etheridge and Diana Suarez are two of Marmoset’s Creative Music Coordinators by day, swooping in to support clients with music searches and clearances for every kind of project under the sun. By night, the two host one of the most buzz-worthy dance nights in Portland —Noche Libre. Assembled of Jené, Diana and six other DJs, the Latinx collective’s mission challenges Portland’s mainstream nightlife scene, where typically only a small demographic is made to feel seen, welcome and safe. Instead Noche Libre cultivates community, creating space for Black, Brown and Indigenous groups. It’s a reflection of their own musical tastes, everything they enjoy jamming to while also encompassing and honoring their Latin heritages and upbringings. The importance of Noche Libre’s presence — other than hearing mixes en fuego — is its movement toward building opportunities and spaces for artists of color within the music industry. With Jené leading Marmoset’s internal Diversity & Inclusion Team and Diana supporting the team’s overarching initiatives, their mission is to disrupt problematic systems to pave way for new processes. From redefining how composers are brought onto creative projects to integrating diversity focused mixers into marketing trips — the team leads objectives that not merely benefit the underrepresented, but the entire company. It’s endless work, but indicative of genuine desire for positive change within an industry that upholds barriers for those who are non-binary or people of color. Jené and Diana daily facilitate interpersonal conversations with other teams, including music producers and members of leadership (among community leaders). There’s a lot of work to be done, but it’s mindful development toward progression. When not attending workshops and programs like Partners in Diversity’s Say Hey night or DJing around town as Noche Libre, Jené and Diana keep busy with their side creative missions. Diana being an experienced florist, she’s responsible for cultivating Y La Bamba and Sávila’s dreamy stage designs — the floral arrangements while laborious, only add to the feat of strength that both Latin American musical groups deliver through their performances. You can also catch Jené co-hosting Everyday Mixtapes on XRAY.FM every Saturday night from 5:00-6:00PM (PDT) — listeners will be pulled in with a mix of throwbacks from R&B, hip hop to funk and vintage gems. So if passing through Portland and catching Noche Libre in action, what can one expect when out on the dance floor? Part of Noche Libre’s mission statement is “to celebrate our family’s roots and rituals by carrying on the tradition of puro pinche pari” — it’s an embodiment of finding strength in identify and to not only live in it, but to celebrate it. Posted on February 26, 2019 by Michelle Goldstein and filed under Community, Marmoset, Music, Music Licensing, Spotlight: Marmoset and tagged Music For Picture Music For Short Film Music For Wedding Films Manage Ad Music campaign Music + Picture Music Licensing. A tried-and-true commitment toward community betterment and keen ear for awesome music, Marissa Hernandez is the kind of woman anyone would be lucky enough to have on their team — or grab a coffee with (one of her favorite things to do). Having a natural instinct toward music and being able to “feel” what works with a creative project isn’t something that can necessarily be taught. But it’s something that Marissa one of Marmoset’s Music Licensing Creatives has a serious knack for and a skill she exercises every day for clients. Music is in Marissa’s blood — her father being a self-taught musician who plays numerous instruments and her mother, who plays both the piano and guitar; her childhood inarguably ran deep with positive music reinforcement. Such an underlying presence prompted Marissa to expand her own music preferences and taste, using the music her parents played for as a child as the springboard for discovering her individualistic musical tastes. Naturally the arts and music were a driving force in Marissa’s life and underlying motivator in college. Inspired by The Current, a public community-focused radio station in Minneapolis, Marissa set her initial sights on music as her career path. With other interests in writing and graphic design, Marissa began scouring how music would fit into her professional pursuits. It was when she discovered her niche in music supervision that she secured her dream job overseeing music to picture — her very first sync and catapulting moment when she pitched a Santigold song, successfully landing it on a Summer Olympics commercial. Aiming to provide exposure to talented, lesser mainstream artists and helping them advance in the music licensing world, Marissa focuses on the bigger picture when pitching music for ad campaigns, films, TV shows and other visual media. After acquiring a wealth of experience in music supervision, Marissa began searching for a place where she could share her passion for community alongside music, eventually making her home at Marmoset as a Music Licensing Creative. Leading her team in internal searches through Marmoset’s catalog of artists for creative projects, Marissa expertly navigates external searches too — a muscle she flexes when a client has ultra specifications for a song they want to license but can’t find it on the Marmoset music roster. Using her knowledge of the music industry and with wide range of resources, Marissa scours and obtains songs that others may not have the same access to or perhaps a lack of insight to inquire about. With her involvement on Marmoset’s Eagle Scout Team — a group dedicated to discovering and recruiting more obscure artists — Marissa also invests her time and leadership on Marmoset’s Greater Good Team, an internal group focusing on community partnership. Her wealth of industry knowledge makes Marissa a force to be reckoned with, being able to interpret a client’s asks and vision, offering up her creativity, guidance and expertise in the most genuine of fashions. At the end of the day there’s no question about it, Marissa makes Marmoset and her community a better place. Listen and play through Marissa’s “All Time Faves” playlist on Spotify. Posted on February 8, 2019 by Michelle Goldstein and filed under Marmoset, Music, Music Licensing, Community and tagged Music For Picture Music Licensing Youtube music Vimeo music commercial music.